Removing a bra wire from a washing machine has happened twice for me over the years. I got one to poke through a hole so I could pull it out with pliers (see Method 1). With the other I used another method to grab it described in Method 2. Its best if you don’t let a bra wire escape from a bra in the first place. This is done by putting the bra in a zip-up net bag especially designed for the purpose. A quick search on the internet for: ‘net bag for bras in washing machine’ will show you the type of bag I mean. Use some form of eye protection. You will be working close up to sharp bits of wire if you follow methods 1 & 2. Ensure the washing machine is turned off at the isolating switch (switch on the wall) or unplugged before working on it. If a bra wire is catching on the drum as it goes around the sound may help you locate it. To see it you will need to look down through the holes in the drum with the aid of a torch You will have to get your head in the drum and use a torch that will stand up on its glass so it shines through the holes while you gently turn the inner drum clockwise a few degrees, then anticlockwise a few degrees, thus rocking it from side to side while you look through the holes. This action will make the holes blur together making the inner drum look transparent. Then you will get a better view of the outer drum and its contents. You can’t rock the drum with one hand, hold the torch with the other and get your head in there all at the same time because the port-hole is not usually large enough. I had a torch which would stand on its glass without falling over too easily. You may need a small inspection or vanity mirror to help you look through the holes. (I had one suitable for sticking on the back of a car sun visor.) When you are able to see through the holes in the drum just rock the drum from side to side as described previously. When you locate the bra wire you may be able to poke a stiff wire, bent to have a hook on the end, through one of the holes in the drum so it can be used to hook around the bra wire and pull it up to make it align with a hole in the drum. Get it to catch on the edge of the hole so that as you turn the drum one particular way it gets forced up through the hole enabling you to grab it with pliers and pull it out. I used an old coil of enamelled wire. To get it through a hole in the drum bend the wire back on itself by about 1 or 2cm and crimp it tight with pliers so that it no longer looks like a hook and the wire touches itself, push it through a hole in the drum bent double like this and then pull the hook up against the edge of the hole to try to open it out into a V-shaped hook ready for use. This method required at least 150mm of thin-walled PVC sleeving1 which was 4mm diameter on the outside. This was an exact fit through the drum holes. The length has got to be long enough to grab hold of and the outside diameter has to be small enough to let it be pushed through a hole in the drum. If you’re not familiar with using wire and electrical sleeving you may need to practice using it before you delve into you washing machine just to find out how hard it can be to thread the sleeving on wire when it isn’t a loose fit. Remember a bra wire is thin and flat and sleeving has a round hole. See where PVC sleeving1 can be obtained in the UK. The method is to feed the sleeving through a hole in the drum near to the end of the bra wire so it can be pushed over the end of the bra wire. This works when the bra wire is wedged in place. You may have to wiggle the sleeving about and try various holes in the drum. You may have to manipulate the end of the bra wire with a hooking wire as used in Method 1. If you can bring the two together push as much of the sleeving onto the bra wire as you can. The bra wire will be flat so the sleeving will go oval to fit over it. When the sleeving is on just pull the sleeving back through the hole in the drum and it will pull the bra wire through behind it. Rotate the inner drum as necessary. As the sleeving stretches it gets thinner and will grip better on the bra wire so it doesn’t come off. If you have difficulty getting the bra wire to come free then do your best to get the end of it through a hole just enough to grip it with your pliers. Once you’re gripping it with your pliers pull hard. It doesn’t really matter if the sleeving is damaged in the act. You want that bra wire out. Any bits of sleeving left in the machine will be relatively harmless and probably collect in the filter or get pumped away. Here the bra wire has the sleeving threaded on it and it is just sticking up through a hole in the drum. Note: I have not tried this method which is one method I would expect from a professional washing machine engineer employed to get something out that was not able to come out any other way. Always be prepared for water to come out when dismantling parts of washing machines. So have an old towel ready. This method involves dismantling the washing machine to gain access to the bottom of the outer drum often at the back, but sometimes at the front, so that the heating element can be removed. The heating element is usually fixed in an oval hole in the outer drum. With the heating element removed it may be possible to pull other things out of the bottom of the outer drum with bent wire, long-nosed pliers or even fingers. Run it forward by 1:45 minutes if you just need to remove the heater. Note: I have not tried this method which is another method I would expect from a professional washing machine engineer employed to get something out that was not able to come out any other way. This method involves dismantling the washing machine to gain access to the water outlet from the outer drum. A flexible pipe connects that outlet to the pump. The bra wire might be poking down into the flexible pipe. Then, when disconnected from the drum, it might be possible to find the wire and pull it out with pliers. If found at that point check the flexible pipe has not been punctured by the bra wire. If it has been punctured it will need replacing. 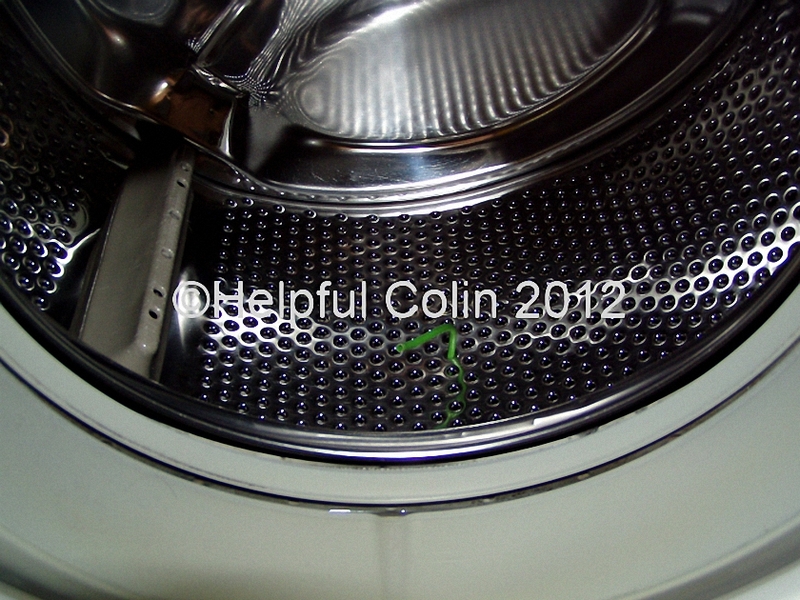 Some washing machines have a thin drain hose accessible at the fluff filter. This is seen in some of the videos above. The water in the drum will just flow out when the bung is removed providing the pipe outlet is below the water level in the machine. To get all of the water out of the pump and pipes a large shallow dish is required. This is so that the whole pipe can get below the water level in the drum. Try a frying pan, grill pan or flan dish. If there’s no thin drain hose at the front try lowering the main drain hose to the ground. It may be necessary to remove pipe clamps to get the hose down to ground level all along its length. The water will then flow out of that when it is below the water level in the drum. The pump doesn’t have to be working for water to pass through it. The pump is required to lift the water up to the normal drain pipe that the hose hooks into. PVC Sleeving is used in electrical/electronic work to cover and insulate what would otherwise be bare wire. It is available from electrical shops and electronic component suppliers, e.g. Screwfix, RS Components. Or as I just done after trying the above method 1 for over an hour and getting nowhere…remove the back panel, unscrew the heating element and remove it. Took me 5 mins that way. Chances are, the bra wire will be wedged in the element anyway so makes sense. Thanks for commenting and putting forward your idea for others to see. It’s a much more certain way to solve the problem than the way I did it, which did take up some of my time. I’ve messed around fixing washing machine problems in the past but never had to remove the heater so it didn’t come to my mind to do that. Sorry to hear you wasted an hour. Thank you so much for your help. Machine was making a horrendous noise, followed your advice with the torch etc. and sure enough bra wire just about visible, managed to remove it and now all good! Phew! Tried the heating element removal first and there it was!! Excellent advice, many thanks! Tried to remove the heating element and could hear the bra wire against it. Unfortunately it is wrapped around the element so much that I could not withdraw it from it’s housing. Any ideas? I recommend using a torch, in the way I suggested in my article, to try and see what it looks like in between the drums. I think the bra wire won’t be wrapped around the heater, like a bobbin of string, but the heater will have at least one loop and there is probably a thermostat tube with it. So the bra wire is likely threaded through these parts and is broadside on forming a cross. Now it’s OK to destroy the bra wire in the removal process. So maybe if you pull hard the wire will bend back and come through the hole that the heater fits through. Even though I’ve suggested just pulling it out, because I’m sure the bra wire will bend before the heater gets damaged, there is a possibility of doing damage to the thermostat or any other sensors that might be fitted into modern machines. If there is a rubber gasket around the hole the bra wire might cut it on the way out. Look up heating elements and thermostats for your machine to find out what they look like. With help you might be able to move the heater so that the wire jammed in it can be lifted to poke through a hole in the drum so you can get some pliers on it. Thanks Colin, really helpful. I pretty much got inside the machine with a torch, saw the bra wire and first tried to hook out with a pathetic piece of kitchen tie I found! Didn’t do much. Then attempted to get the front of the machine as the back is fixed, had researched where to find heating element, but failed as screws were too tight arhhhh….. So went back to the inside, got my bit of wire again and just rocked the drum gently back and forth with the wire stuffed in a hole close to the bra wire. Within a couple of minutes of rocking the tip of the bra wire appeared through another hole, so as instructed I got the pliers and pulled it through. Really chuffed, thank you again. It’s good that you were persistant. When I resolved my problem desperation made me persistant. I knew that if I didn’t succeed I would either have a big bill, a big disturbance in the kitchen or both. It’s good that you’ve been successful. 1. the oven is difficult to work on because it is heavy to remove from its cabinet and it sits in an awkward place in the kitchen. (Now I know they are a lot lighter with the doors removed). I don’t have it covered anymore because after eight years it was deemed too old to fix when I reported a resetting in the middle of cooking issue. I then modified it to resolve the problem. It’s been good for several years now. NOTE: Modifying anything like an oven is a big NO NO in the safety world. We are all expected to find hundreds of pounds for replacements. 2. the dishwasher was the first one I had so I had no experience with one. 3. you cannot live without a washing machine so they need fixing pronto. Since 2003 all three items have needed more than one repair. The company sent to fix them was efficient but the insurance is quite expensive. 1. Experience told me fridges and freezers usually last a very long time until they need replacing anyway. 2. Tumble dryers only have a motor, timer and heating element to go wrong and are easily repared if you can get the parts. Also I’ve seen them go on for years without any problem if they are kept clean. I have a Bosch 300 series front loader and was able to remove a bra wire through the bottom drain. Disconnect power and water. Remove the back cover from the machine. At the bottom of the drum you will see a black hose about 2.5″ in diameter connected to the drum. Place a shallow pan under the hose (there will be at cup or two of water) Remove the clamp and slip the hose off. I was able to slide the bra wire to the drain hole by pushing it along with a wire from inside the basket. When you get it over the drain hole you can reach it with a couple fingers. Entire process took about 20 min. Well done Marty. I’m sure readers will be want to know all the ways possible to remove foreign bodies from their washing machines. Thanks for sharing your experience. It’s nice to know you had success.